No-kill shelter rescues stray, feral, abused and neglected dogs and cats. 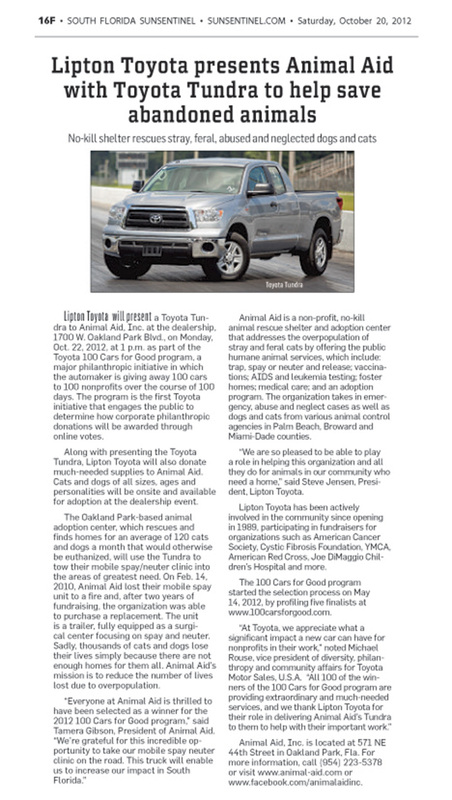 Lipton Toyota will present a Toyota Tundra to Animal Aid, Inc. at the dealership, 1700 W. Oakland Park Blvd., on Monday, Oct. 22, 2012 at 1 p.m. as part of the Toyota 100 Cars for Good program, a major philanthropic initiative in which the automaker is giving away 100 cars to 100 nonprofits over the course of 100 days. The program is the first Toyota initiative that engages the public to determine how corporate philanthropic donations will be awarded through online votes. Along with presenting the Toyota Tundra, Lipton Toyota will also donate much-needed supplies to Animal Aid. Cats and dogs of all sizes, ages and personalities will be onsite and available for adoption at the dealership event. The Oakland Park-based animal adoption center, which rescues and finds homes for an average of 120 cats and dogs a month that would otherwise be euthanized, will use the Tundra to tow their mobile spay/neuter clinic into the areas of greatest need. On Feb. 14, 2010, Animal Aid lost their mobile spay unit to a fire and, after two years of fundraising, the organization was able to purchase a replacement. The unit is a trailer, fully equipped as a surgical center focusing on spay and neuter. Sadly, thousands of cats and dogs lose their lives simply because there are not enough homes for them all. Animal Aid’s mission is to reduce the number of lives lost due to overpopulation. Animal Aid is a non-profit, no-kill animal rescue shelter and adoption center that addresses the overpopulation of stray and feral cats by offering the public humane animal services, which include: trap, spay or neuter and release; vaccinations; AIDS and leukemia testing; foster homes; medical care; and an adoption program. The organization takes in emergency, abuse and neglect cases as well as dogs and cats from various animal control agencies in Palm Beach, Broward and Miami-Dade counties. “We are so pleased to be able to play a role in helping this organization and all they do for animals in our community who need a home,” said Steve Jensen, President, Lipton Toyota. Lipton Toyota has been actively involved in the community since opening in 1989, participating in fundraisers for organizations such as American Cancer Society, Cystic Fibrosis Foundation, YMCA, American Red Cross, Joe DiMaggio Children’s Hospital and more. Animal Aid, Inc. is located at 571 NE 44th Street in Oakland Park, Fla. For more information, call (954) 223-5378 or visit www.animal-aid.com orwww.facebook.com/animalaidinc.